Participant recruitment and retention are also challenges in prison- and community-based family support programs of any type. Given the competing programs in which prisoners may participate, such as work release programs or substance abuse treatment, they may feel that family strengthening programs are less important or not relevant to them (Bobbitt & Nelson, 2004). Many inmates cannot afford to spend unpaid time in training and educational programs after release (Jeffries et al., 2001). Inmates may also be skeptical of programs that involve discussions about sensitive family-related topics (Eddy et al., 2001). 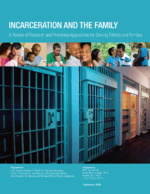 Large numbers of inmate transfers between facilities, early releases, frequent residential moves upon release, the likelihood of reincarceration, and the fragility of family relationships make retention and follow-up evaluation difficult (Eddy et al., 2001; Palm, 2001; Meek, 2007). It is also important to identify appropriate participants for family strengthening programs. Some men may not be ready to participate in such programs due to a previous history of domestic violence or child abuse (Bobbitt & Nelson, 2004; Palm, 2001). Other men have mental disorders and limited reading ability, both of which may inhibit their ability to comprehend program materials (Eddy et al., 2001). Additionally, the demands placed on released fathers to attend court hearings, parole appearances, and other appointments may limit their ability to participate in programs in the community (Jeffries et al., 2001). Agencies need to develop strategies for identifying and recruiting participants, either while they are in prison or after they are released. Strategies may include referrals from corrections or parole departments or from other programs such as substance abuse treatment centers. Staff offering prison-based programs could recruit inmates directly by providing presentations about project topics along with referral forms for participation (Eddy et al., 2001). Incentives could be provided for participation, such as small monetary payment, additional free time, or family visitation privileges. Outside of prisons, it may be a challenge to identify large numbers of reentering fathers in a given geographic area. Once participants are recruited, developing a tracking form for each person may improve follow-up with additional services and evaluation activities (Eddy et al., 2001).